This is a town in the south of France near the Spanish border. 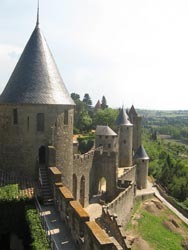 Due to it location it had extensive fortifications in the Medieval Period. 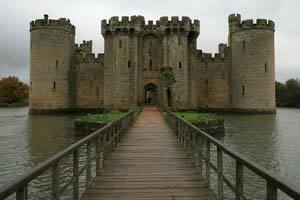 This was built in 1385 by Sir Edward Dalyngrigge upon his return from the Hundred Years War. 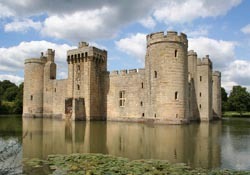 While Bodiam looks like the classic textbook castle evidence suggests looks rather than defence was the design priority. Against a serious attack by a decent army with proper siege equipment it would be lucky to hold out for a couple of days. The walls are not very thick, the moat is easily emptied, the battlements are a bit puny and it has a big church window in one wall. However it is quite defensible from a crowd of revolting peasants, a quick visit from some stroppy neighbours and their hired goons or a midnight call by a French raiding party. For a person of Sir Edward's stature or lack thereof these were probably the priorities. 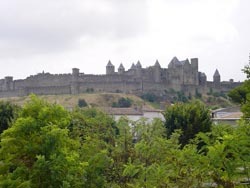 It should be noted that the area around the castle was extensively landscaped and the whole layout with the Castle in the middle would have looked [and still does] extremely pretty. Sir Edward after all was building his retirement home. 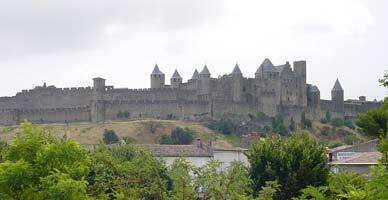 This is an attempt by a group of Historical Enthusiasts in France to build a completely accurate medieval castle using historically correct building materials and methods. 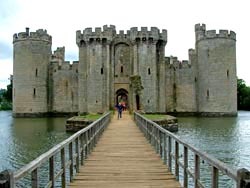 Most Castles from the middle ages still in good condition have been extensively modified over the centuries. Most such castles should more correctly be considered Palaces or Mansions. While the people involved have put in a great deal of work and achieved a great deal they do not have the large workforce of several thousand [ or at least several hundred] that a real medieval construction site would have. Thus the whole project is expected to take about 20 years to complete. Please note the place is a tourist attraction with inspections tours and shows.